1Preheat the oven to 350 F (175 C). Line two 12-cup muffin pans with cupcake liners. 2In a large bowl, sift together the flour, cocoa, baking powder, baking soda and salt. 4Fill the muffin cups three-quarters full. Bake until the tops are firm and a cake tester inserted in the center of a middle cupcake comes out with just a few crumbs clinging to it, about 20 minutes. Let the cupcakes cool for 5 minutes in the pans before removing them to a rack to cool completely. 1In a stand mixer fitted with the paddle attachment, cream the butter. Start with the mixer at the lowest speed, then gradually increase the speed, using a rubber spatula to scrape the bowl as needed, until the butter is light in color, is perfectly smooth, and makes a slapping sound as it hits the sides of the bowl. This should only take 30 seconds, but if the butter is cool, it can take a couple of minutes. 2Add the sugar, 1 cup (about 110 g) at a time, and mix at the lowest speed until it’s fully incorporated before adding the next cup. When all the sugar has been added, scrape the paddle and the bottom and sides of the bowl. Add the vanilla and salt, and beat at low speed for 15 seconds. Increase the speed to as high as you can without making a mess, and whip the buttercream until it is perfectly smooth, creamy, and light, about 5 minutes. Stop the mixer once or twice to scrape the bowl and paddle, then continue beating. 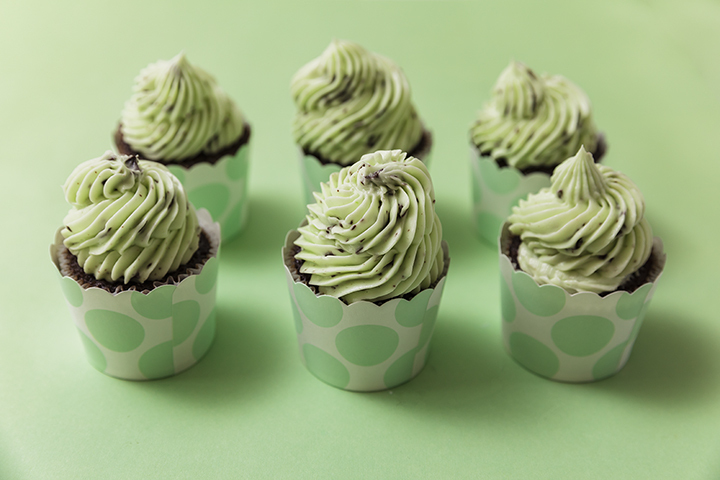 At first the buttercream will appear to soften, then it will stiffen and increase in volume. 3Add in green color gel. Pulse in chopped chocolate. 4Use right away, or store in an airtight container for up to a week in the refrigerator. When you’re ready to use it, let the buttercream come to room temperature, then put it back in the stand mixer and use the paddle attachment to beat it until it’s creamy and stiff again.